ASAA (Alberta Schools' Athletic Association) and Football Alberta Press Release, Nov 8, 2016 below. A shout out to a former Bulldogs Football Mom, Laurie Hanna, mother of Jack 2011-2013 and Alex 2012-2014 for securing us a corporate sponsorship from the Black Diamond Group. A couple of pictures from our rivalry game Vs. the cross-town Paul Kane Blues on Friday Oct 7. COACH HILL'S WHITE TEAM IS VICTORIOUS OVER COACH GUY'S CARDINAL TEAM BY A SCORE OF 16 - 8 IN THE 5TH ANNUAL DAWG BOWL LAST NIGHT AT RIEL PARK. THE LIGHTNING SHORTENED GAME WAS FULL OF GREAT PLAYS, HITS AND EXCITING SCORING PLAYS. TEAM WHITE NOW HAS A 3-2 EDGE IN THE SERIES WITH THEIR THIRD CONSECUTIVE WIN. COACH HILL'S RECORD IN THE DAWG BOWL IMPROVES TO 2-0 WHILE COACH GUY'S RECORD DROPS TO 0-2. A GREAT TIME WAS HAD BY ALL PLAYERS, COACHES, PARENTS AND FANS. THIS YEAR'S DAWG BOWL MVP WAS SHARED BY GRADE 10 PLAYERS, QUADE KOZAK OF TEAM WHITE AND CORDEL CALLIOUX OF TEAM CARDINAL. FOLLOWING THE GAME BACK AT THE SCHOOL THERE WAS A BBQ FOR PLAYERS, SPIRIT TEAM AND BOOSTER CLUB MEMBERS. JUST AFTER THE PLAYERS RETURN TO THE SCHOOL, THE TEAM CAPTAINS SHOWED THEIR APPRECIATION TO COACH KIRBY. KIRBY WAS A GUEST COACH FOR BULLDOGS SPRING CAMP BECAUSE HE WAS DISPLACED FROM HIS HOME IN FORT MCMURRAY. LET'S JUST SAY COACH KIRBY WAS 'WRAPPED UP' WITH PLAYERS APPRECIATION. THERE WAS WORD THAT COACH 'O' (LARRY OLEXIUK) WAS THE MASTER PLANNER OF THIS APPRECIATION. SEE YOU ALL ON AUGUST 15TH WHEN WE GET DOWN TO WORK! Bellerose D-Line Coach Paul Allen challenges the Bulldogs players and coaches to do the 22 in 22 challenge in support of PTSD (Post Tramatic Stress Disorder). Football Alberta announced that Bulldogs Football player Brett Yost of the 2016 Alberta Summer Games Black Gold (Zone 5) Team will represent the province on Football Alberta's U16 Team in the 2017 International Bowl in January. Details of the International Bowl for 2017 have yet to be released. The last two events were held in Arlington, Texas and played in AT&T Stadium (home of the Dallas Cowboys). Brett played in the fall of 2015 for the St. Albert Fury Bantam Team and spring 2016 for the St. Albert Storm Midget team and will suit up for the Bulldogs this fall. Congratulations Brett on your outstanding achievement and selection to this all-star team from Alberta. 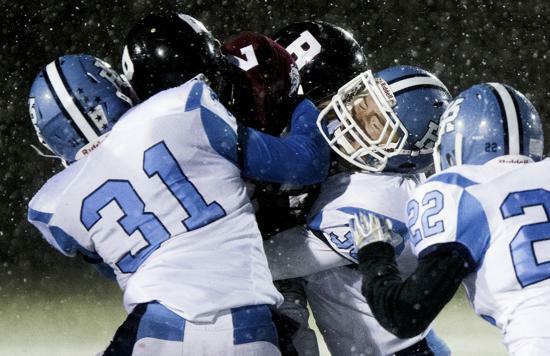 After 34 consecutive wins in league and playoffs and four-straight championships, the Bellerose Bulldogs tasted defeat for the first time since the 2011 playoffs in metro Edmonton junior football. The Jasper Place Rebels pulled the plug on the Bulldogs with a convincing 27-11 decision in Monday’s division one semifinal at Johnny Bright Park. The Rebels played like a team on a mission for championship honours and the Bulldogs looked like a team that was scared to lose instead of hungry to win. The Bulldogs were unable to match the physicality of the Rebels and struggled to execute basic concepts on offence and special teams. On defence, the Bulldogs plugged up the middle against the double-wing offence but got beat on the edges with the fly sweep. The Bulldogs were the top pool B team at 5-0 for a bye into the semifinals while averaging 50.6 points per win and 16.2 against. The victory was the fifth in a row for the Rebels (5-1, 194 PF/66 PA) after placing second in pool A and in the crossover playoff round they mauled the injury-depleted Paul Kane Blues (3-3) 51-8. Last year the Bulldogs survived a tight 7-6 affair with the Rebels in the semifinals. 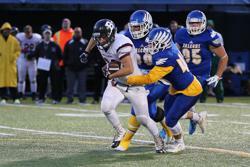 This year’s edition of players from the Bellerose and Sturgeon high schools featured six returnees from the 6-0 lineup that leveled the Bev Facey Falcons 41-6 in the 2015 final for the junior program’s 29th straight win and fourth undefeated junior championship in as many years. The metro record for consecutive junior football banners is five in a row by the 1991-95 St. Francis Xavier Rams. Facey was the last team to defeat the Bulldogs before the Rebels pulled off the feat and the score was 17-12 in the 2011 semifinals. 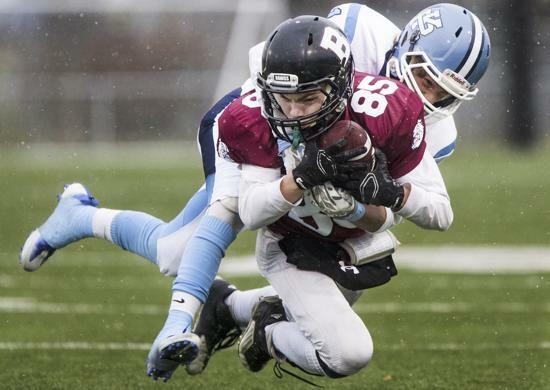 The Bellerose Bulldogs are chasing history as the front-runners in the high school junior football playoffs. The leaders of the pack are 5-0 this year and 34-0 in league and playoff action since the 2011 semifinals when they huddle up against the Jasper Place Rebels (4-1) in Monday’s metro Edmonton division one semifinal. Kickoff is 7:30 p.m. at Johnny Bright Park. The winner butts heads with the Bev Facey Falcons (4-0) or Memorial Marauders (5-1) in Friday’s final at 7:30 p.m. at Clarke Park. A five-peat would equal the metro record for consecutive junior football banners by the 1991-95 St. Francis Xavier Rams. The Bulldogs yanked the proverbial victory from the jaws of defeat in their second-last pool B game before the playoffs and it was the 54-50 gong show against Memorial in Spruce Grove. Leads of 21-6 after the first quarter, 35-22 at halftime and 41-28 in the fourth quarter slipped away before the Bulldogs regained the upper hand at 48-42. However, a touchdown and two-point conversion put Memorial back on top at 50-48 with 1:15 remaining. 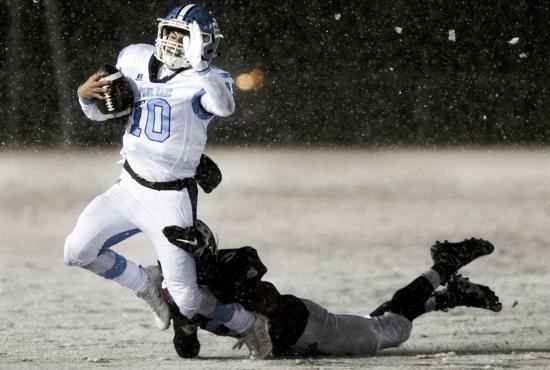 The wild roller-coaster ride ended with Andrew Nielson’s quarterback run of 30 yards for the go-ahead points with 37 seconds to play. The Bulldogs will have their hands full against the Rebels despite averaging 50.6 points per win and 16.2 against. The Rebels placed second in pool A and in Monday’s crossover playoff crushed the injury-riddled Paul Kane Blues 51-8 for their fourth win in a row. The Rebels (167 PF/55 PA) were coming off their bye week and the team’s double-wing backfield pounded the Blues (3-3, 206 PF/161 PA) during a 36-0 first-half advantage. “They look like a very good team. They play a tough game. They’re a tough team too. 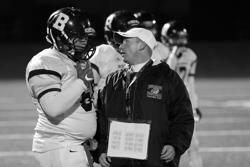 They know what they’re doing and they don’t give up until the end of the fourth quarter,” said Marsh, 17. Last year the Bulldogs hung on to defeat the Rebels 7-6 in the semifinals, en route to blowing away Facey 41-6 for their 29th straight win and fourth undefeated junior championship while going 6-0 on the season. The 2015 lineup of Bellerose and Sturgeon high school players included Marsh, LeLacheur, Nolan Flatla, Michael Kosch, Dylan Long and Sheldon MacKay from the current junior roster. “Both teams are really good teams. This team is a very young team as well,” said Marsh, a versatile Grade 11 defender who leads the Bulldogs in tackles with 25 and is tied for the team lead in sacks with two. “It’s the hypeness. The guys are all pumped for the games and they’re all excited. The practices are the same too,” added LeLacheur of the similarities of the two Bulldogs teams. The junior Bulldogs were spotted at Riel Recreation Park on Wednesday instead of their home stomping grounds in the high school’s backyard in preparation for Monday’s playoff. Spirits are high in Bulldogs Nation with one week left in the season and another trip to the final looming large. The last junior game before the metro Edmonton football playoffs is the Battle of St. Albert on Tuesday. Kickoff is 6 p.m. between the Bellerose Bulldogs and Paul Kane Blues at Riel Recreation Park. Bellerose won the last four showdowns after losing the inaugural 2011 battle against Paul Kane and the 2015 result was 14-7. In pool B, Bellerose is 4-0 and Paul Kane is tied with the Memorial Marauders at 3-1 and all three teams have qualified for the division one crossover playoffs with pool A. The opening playoff round starts Oct. 24 and the top A and B pool teams have byes into the Oct. 31 semifinals at Johnny Bright Park. The final is Nov. 4 at 7:30 p.m. at Clark Park. Bellerose, winner of the last four championships, is undefeated in 33 league and playoff games since losing the 2011 semifinal to the Bev Facey Falcons. The last victory was the 54-50 score fest with Memorial this week in Spruce Grove. Bellerose had surrendered only 10 points in its last three wins and 26 overall last year while going 6-0 before the defensive meltdown. Bellerose is averaging an astonishing 53.5 points per game but will have to tighten up defensively against an explosive Paul Kane offence averaging 44.3 points. Igniting the spark for Paul Kane is quarterback Russ Dixon as his 194 yards passing and one touchdown and 104 yards rushing and two TDs propelled the Blues past the St. Joseph Saints 48-20 this week in St. Albert. In the process, Dixon raised his season totals to 429 yards on the ground and seven TDs and 801 yards in the air and eight TDs. The bantam graduate of the West Edmonton Raiders and Team Alberta U16 selection for the 2017 International Bowl in January at AT&T Stadium in Arlington, Texas galloped 48 and 34 yards for a pair of TDs in the first half against the Saints (1-3). Paul Kane overcame a sluggish start of dropped balls, missed tackles and a slew of penalties to lead 21-13 at halftime. Back-up running back Jamie Carswell, forced into action due to an injury to starter Matt Curtis, added a three-yard TD in the second quarter. The Saints scored twice in the first half, including a 36-yard Hail Mary. In the third quarter, Dixon found Ty Baird for a 76-yard pass and run TD and it was followed on the Saints’ next possession by Brenden Wagensveld’s 58-yard pick-six interception. Carswell and fullback Rylan Baerg found the endzone in the fourth quarter in response to the Saints’ TD. Carswell rattled off 75 of his 113 rushing yards in the last quarter to help run out the clock. Defensive end Josh Dahunsi also recorded six tackles for losses as Paul Kane posted its first victory against the Saints in the junior ranks. 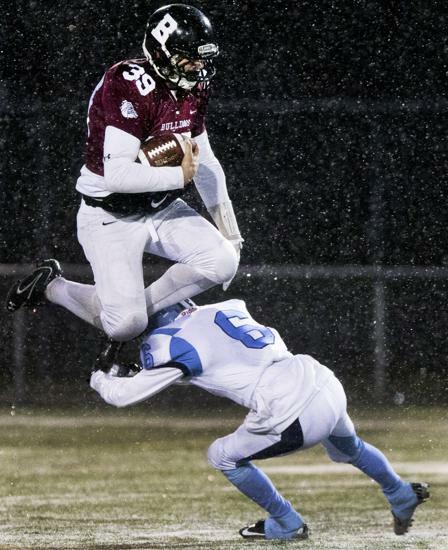 Meanwhile, Bellerose breathed a sigh of relief after surviving a huge scare against Memorial. Six turnovers, more than a handful of pass interference calls that kept drives going or moved the ball to the one-yard line and several penalties that cost Bellerose field position or negated significant yardage gains almost ended the 33-game winning streak. Bellerose was also shorted a down on one offensive drive as the stick crew struggled to flip to the correct down and the Bulldogs were forced to punt in the third quarter leading 41-22. The snafu paved the way for a Memorial TD. The Coles Notes game summary supplied by Bellerose is lengthy so the short version starts in the fourth quarter and Bellerose in front 41-28 after leading 21-6 after the first quarter and 35-22 at halftime. Four plays into the quarter, Memorial scored and added the two-point conversion after Bellerose was flagged for pass interference on the first attempt at two points. On the next defensive series, linebacker Darryl Marsh appeared to strip the receiver of the ball then scooped it up and ran into the endzone. However, the officials blew the play dead and ruled the play an incomplete pass. The defence held but Bellerose fumbled the punt return. Memorial went on to score on a drive that was kept alive by another pass interference call. It was 42-41 Memorial after the two-point conversion was unsuccessful with 2:46 remaining. After the kick-off, Bellerose marched the ball on first-down runs by Sheldon MacKay and Andrew Nielsen and the drive was capped off by MacKay’s 20-yard TD run with several tacklers draped all over him. Trey Lavoie’s convert put Bellerose back on top at 48-42. Memorial returned the kick-off inside the Bellerose 30 and one play later the quarterback reached the endzone to knot it at 48. On the two-point conversion, the Memorial slotback went low to catch the ball and it appeared to hit the turf but it was ruled a catch to make it 50-48 with 1:15 remaining. Back on offence, Bellerose huddled up at its 50 and four plays later Nielsen scrambled 30 yards on a designed quarterback run to score with 37 seconds left. The two-point attempt was unsuccessful as Jared Koziol was unable to hook-up with wideout Cory Hannam. The defence closed out the wild affair by stopping Memorial on downs and the offence then took a knee on consecutive downs. Nielsen and Koziol split quarterback/receiver and safety duties. Koziol started at quarterback and was picked off three times but connected with Nielsen on a highlight-reel 45-yard Odell Beckham Jr. style one-handed catch-and-run TD in the first quarter. Nielsen was able to extend the one arm up for the dazzling reception despite tight coverage and then proceeded to shake off a face-mask grab before crossing the goal line. Lavoie’s convert made it 21-0. The 27th Annual Senior Bowl will be played in Edmonton's Commonwealth Stadium on Monday, May 23, 2016 with a Noon (12 PM) kick-off. This is a program that features the top Graduation Grade 12's from Alberta H.S. 's broken up in a North vs. South contest supported by the Edmonton Eskimos and Calgary Stampeders. Senior Bowl “North” All-Star Team includes three Bellerose Bulldogs. Congratulations to our 3 Bulldogs, well done Jaedon and the 2 Matts! Congratulations to these 3 Bulldogs Football players for being chosen as a Carr Division 1 All-Star. in 2016. James and Cordel will play another season for the Bulldogs in 2017 and Chase will graduate this June. 32 Athletes in each division have been selected as the top contributors in their respective positions. The Top Quarterback, Top 3 Runningbacks, Top 6 Receivers, Top 6 Offensive Linemen, Top 5 Defensive Linemen, Top 5 Linebackers & Top 6 Defensive Backs have been selected by League Coaches to make up the All - Edmonton Football teams for all three of Metro's Sr. Football Divisions. Click the link below to see a complete list of All-Stars! Congratulations to Mr. Chad Hill, who was named the 2016 Coach of the year for Football in the Carr Division by the Metro Athletics staff. Chad was selected and voted upon by his peers within his respective division. This selection showcases his devotion to the game, as well as his commitment to an inclusive environment when interacting with players, fellow coaches, officials and fans.